It was 1963 when Ireland last won the Glorney Cup. The President of Ireland, Mr. Michael D. Higgins spoke elegantly at the opening ceremony which most certainly gave everyone a sense of importance about what was to come over the next 3 days. This year the Irish Glorney team, lead by Conor O’Donnell (Fide Master), managed to win this ancient cup by the narrowest of margins over habitual winners England. The team included two 12 year old boys (Tom O’Gorman who scored 5.5/6 & Alex Byrne who was undefeated on board 3), the experienced (and charismatic) Scott Mulligan played board 2 and Conor Maher who scored the decisive 1/2 point by drawing against a higher rated opponent in a seemingly lost ending in the very last game.. There was more .. our u-14’s team danced away with the Robinson Cup, convincing winners and the first time Ireland had won this section. In the u-12’s (Stokes Cup) we had 5 new players who learned what it takes at this level & they’ll be pushing hard to get back on Team Ireland next year. However, there was heartbreak too. Just as we’d won the Glorney on a tie-break the Irish Girls team lost the Gilbert Cup by the same system. 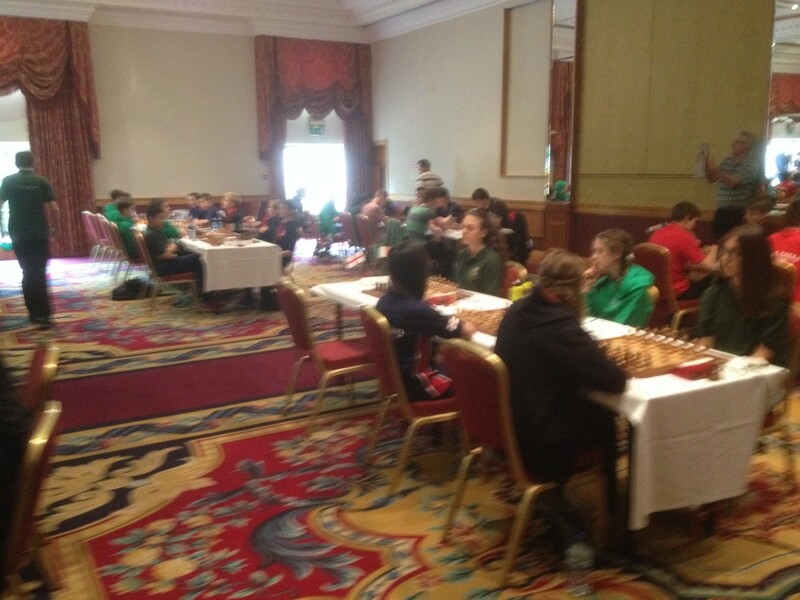 England and Ireland had been joint first in the 2 main events and the tie-break will hurt for those that missed out. It’s fitting to congratulate England on their Wins in the Stokes (squeezing past an excellent Welsh team by a half point) and the Gilbert Cup. One parent told the organisers that .. ” I would not have thought ‘spectator chess’ could have been so compelling but I found the whole experience enthralling. Brilliant and well deserved victories for the Irish in an excellently run event. ” .. On the last day, as each player left the hall they had to pass through the “spectators room” where the parents were watching the games live on a cinema style projector. And as the Irish players quietly slipped out of the tournament hall they were shocked and stunned by the standing ovations (regardless of result) from a very partisan Irish auditorium. There may never be a Glorney to match this again, or has Ireland set a new norm. In 2016 and further into the future we’d love for our Galway juniors to experience this uniquely special event. And the West of Ireland league is one starting point for players games to be rated and then they can get noticed by the ICU. And finally, finally .. The venue was the oh so plush Johnstown House Hotel, 4 star hotel – which received numerous and repeated praise from all quarters. (see www.glorneycupchess.org for all the games and details, I recommend Conor Maher’s draw in the last round for sheer character under extreme pressure and also Tom O’Gorman’s “exchange sac” in game two is a must view for it’s mind-boggling creativity !